I feel like this month has gone pretty quick, quicker than all the rest, although I am writing my favourites a little early. I want December to be all about Christmas so you are getting this in advance! Just like every month I wanna share my what I have been loving! Enjoy!! They are obviously gluten-free but they are also vegan and all natural. I love to try new bars as it gets quite boring eating the same thing every day. Pumpkin seeds are one of my favourite things to eat and with the Cashew and Chia Seeds, this is just a win!! I haven't taken a pic, but just imagine warm porridge on a cold morning steaming in the bowl! I used to loveee porridge but went completely of it, but now that the weather is so cold in I want something to warm me up in the morning ! I forgot how much I love it, I have been loving golden syrup or Apple and Cinnamon Porridge!! Now if you read my Zoella Christmas or Autumn Essentials post you will know how much I am obsessed with this scent!! If you don't know it is gingerbread and it honestly smells edible! I have been waiting to actually use it as I want to wait until it is very festive and now is a perfect time!! It makes my hands feel so soft and smell lush!! I actually picked this up by accident when I was trying to get the normal one, but I thought I would give it a bash! It makes my lashes really long and I can get away with just wearing this rather than a few layers!! I don't, however, like the wand, it has a weird top and moves about a lot lol. It has been a staple in my everyday makeup, however, it takes a whole lot of effort to actually get it off which takes me to my next favourite!! This has been perfect to take off the remainder of my mascara without being too harsh on my eyes, It feels so nice and soothing. I have fallen in love with this so I have actually put the full bottle on my Christmas list, it certainly has made its way into my night skincare routine!! November has honestly been all about haircare, if you didn't know I chopped my hair short a few weeks ago so I have had to change my hair care!! The first thing I will say is that I have had to put so much more effort in than before, my straighteners have been working overtime to make sure my hair is presentable each day. I am happy though as it means I can use these gorgeous Rose Gold GHDs!! With all the straightening I am scared my hair is just going to give up on me, I have pretty healthy hair so I don't want it to be frazzled! I picked up this heat defence spray in boots as I have used Tresemme products before, and I love it!! It feels so light on my hair and does the job! It also give my hair a little shine which is just a bonus! The last thing I have been loving this month is the Lee Starfford Mouse, my hair has absolutely no volume what so ever so when I got my hair chopped it was more noticeable! I needed something that gave me a boost with it making my hair too mad!! This is perfect, as it say on the bottle it doesn't make my hair crispy and heavy, it gives it volume but still feeling light!! Not to mention the smell is insane and takes me back to my Summer Holidays in Malta!! Let me know what you are loving this month?? I also want to kinda announce that I will being doing my take on 'Blogmas' I can't commit to one post every day but I think my schedule will be twice a week with maybe some extras thrown in there!! I feel like this is my first proper Christmas, fully into my blog so I really want to go all out!! I'll be obviously posting on here but make sure you Follow me on Twitter for updates!!! Hope you are having a wonderful day and are excited as I am for next month!! Fab faves! Lee Staffords Coco Loco range is insanely good and smells absolutely delicious! Great post! I'm still to try Zoellas new range :o might need to treat myself for my birthday! omg I really want Zoella's hand cream! that looks and sounds delicious and amazing haha! These are some great products! I've been wanting to check out the new Zoella Xmas range for so long but my local store doesn't stock it! 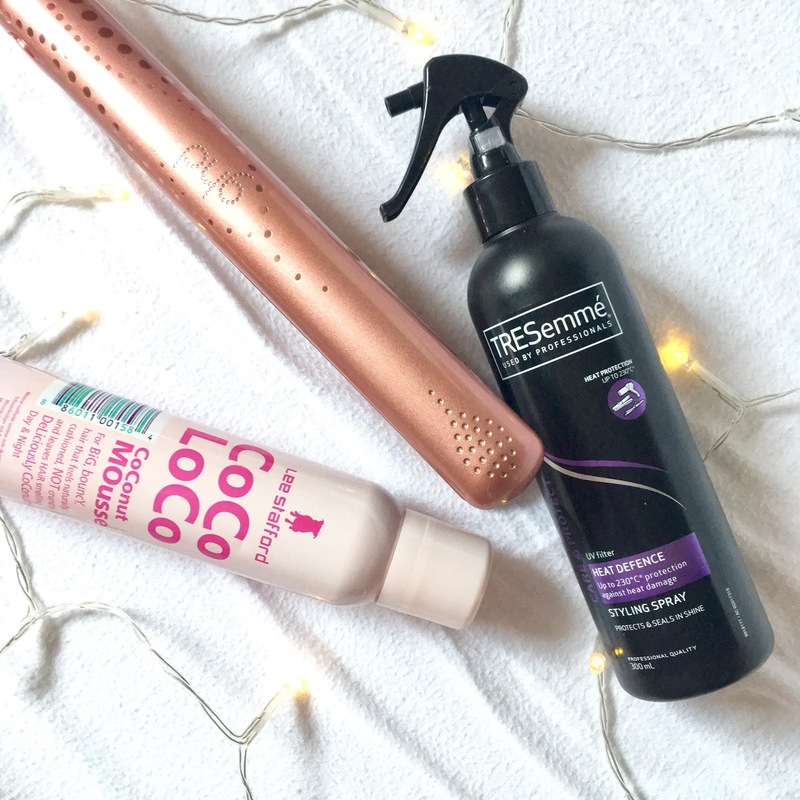 I've been using the Tresseme heat defence spray for years and its a firm favourite for so many reasons! I've been meaning to try Zoe's new hand cream in the gingerbread scent. Every blogger seems to be loving it right now and putting it in their posts!